My 25 year old daughter, Meira, is an amazing, determined goal setter. She deals with life challenges like speed bumps rather than barricades. A few weekends ago, after months of training, Meira and I drove to downtown St. Louis at 5:30 in the morning so that Meira could run in her first half marathon. I stood near the finish line taking photos and cheering her on as she completed the 13.1 miles! I am very proud of her. Recently, Meira became gluten free, due to health issues. 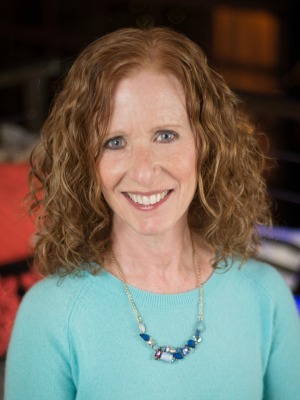 The adjustment isn’t terrible but it can be frustrating, especially with a food blogger mother who seems to keep King Arthur Flour in business. I do make gluten free treats for her but I don’t usually blog about them. There are so many gluten free baking bloggers who share amazing recipes. 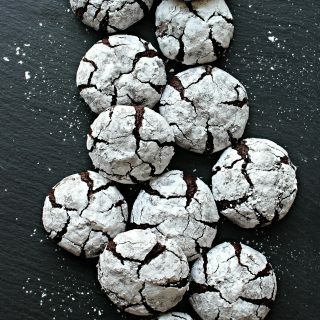 However, today I am posting a cookie recipe that happens to be gluten free. I created Chocolate Chip Almond Squares for Passover but they are so good we will be eating them all year! 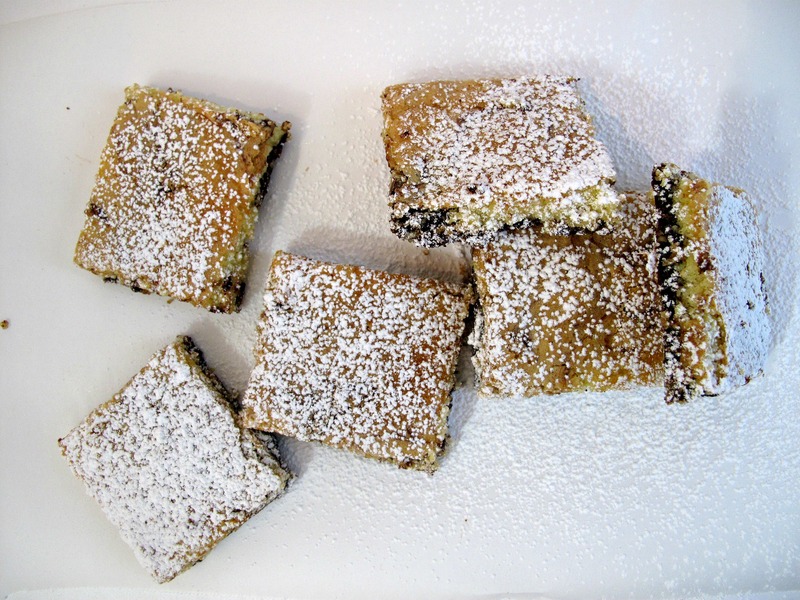 To be honest, Chocolate Chip Almond Squares were a complete accident. They are a baking disaster that turned into a delicious discovery. I have the world’s best recipe for Passover chocolate chip mandelbread. 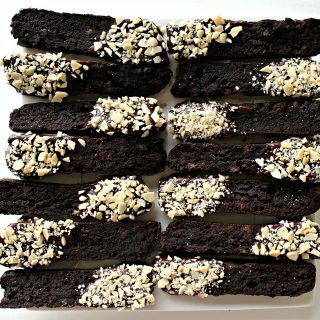 Mandelbread, for those who haven’t had it, is very similar to a biscotti, the Italian twice baked cookie, but this version is only baked once. What makes it a Passover recipe is the use of matzo cake meal (very finely ground matzo with the consistency of flour) instead of all purpose flour. I thought I would play a bit with the recipe and try to make some gluten free mandelbread for Meira. In one experiment I substituted finely ground almond meal/flour for the cake meal. The dough was very wet and more like a batter. Trying to firm it up, I refrigerated the dough for several hours. Though the chilled dough was still very batter-like, I shaped it into a rough log on a parchment lined baking sheet and stuck it in the oven. Five minutes later I noticed the edges of the log seemed to be melting. Hoping that it couldn’t possibly melt much more, I left it in the oven. A few minutes later the log of dough had turned into a puddle of batter spreading out over the entire cookie sheet and beginning to drip into the oven. My reaction was due to panic rather than baking brilliance. I grabbed the edges of the parchment paper and folded them inward to momentarily contain the escaping batter. Then I plopped the whole parchment package onto a jelly roll pan with sides. At this point my choices were to throw the whole thing in the trash or smooth out the parchment, spread the batter as evenly as possible, and stick it back in the oven. I chose the oven over the trash can which turned out to be an excellent decision. Half an hour later I had a pan of golden brown cookie with swirls of melted chocolate chips. 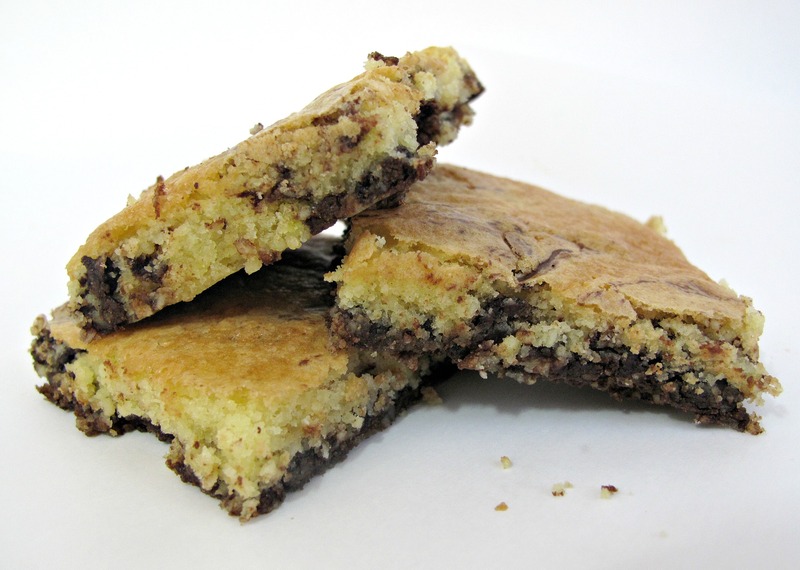 I cut the soft, tender pan cookie into squares. 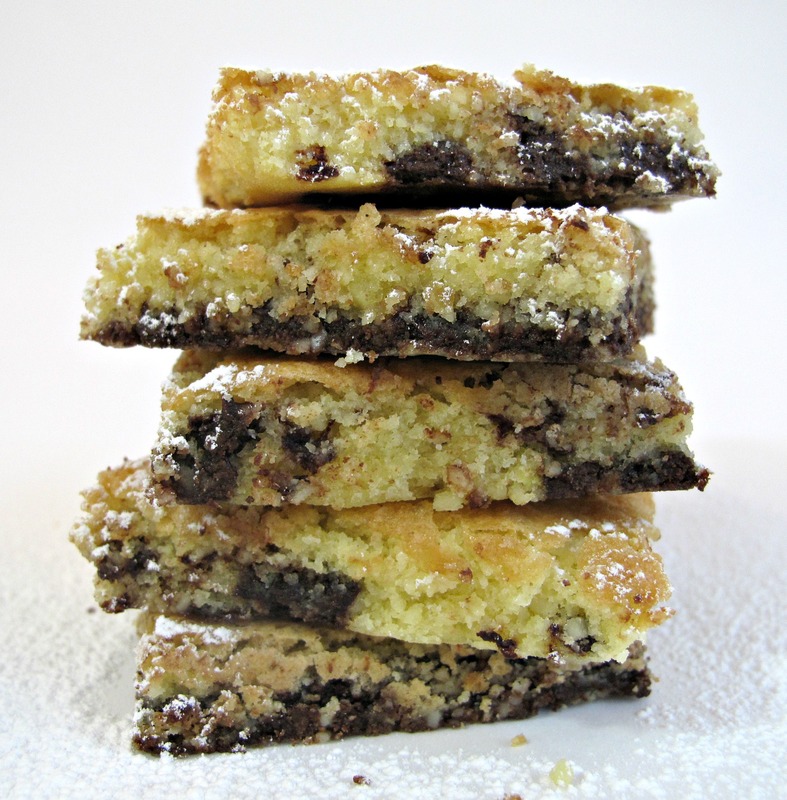 The Chocolate Chip Almond Cookie Squares received rave reviews from my taste testers. They aren’t the gluten free mandelbread I had intended, but instead we have a new family favorite. 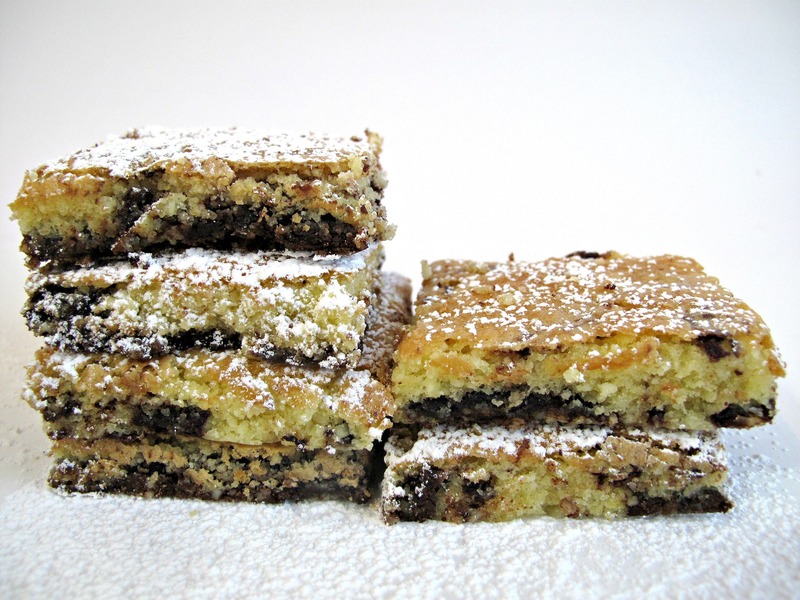 Usher out the last night of Passover tonight with a sweet tray of Chocolate Chip Almond Cookie Squares or just bake them to savor. No one will notice the lack of wheat flour while they feast happily on the flavors of almonds and chocolate. Preheat oven to 350° F. Line a jelly roll pan (15” x 11”baking pan with sides) with parchment paper allowing a few inches of overhang on the long sides. In the bowl of an electric mixer, cream together the sugar and butter. Add the eggs one at a time and almond/vanilla extract. Beat to combine. In a medium bowl, whisk together the almond meal/flour and potato starch. Stir into the creamed mixture. Spread the batter evenly, from edge to edge, into the prepared pan. Bake for about 5 minutes, or until the chocolate chips are melted. Remove the pan from the oven and, using a rubber spatula, swirl the melted chocolate into the batter. Return the pan to the oven and continue baking for another 15 minutes, just until the top is dry and golden brown. Remove from oven and slice into squares. Allow the squares to cool completely in the pan before removing to serve or store. Store at room temperature in an airtight container for at least 5 days. Double wrap piles of 2-4 squares in plastic wrap, then place the bundles in a column, in a plastic storage container. Use crinkled wax paper, if necessary, between the cookie bundles and the lid of the container to ensure there is no movement during shipping. 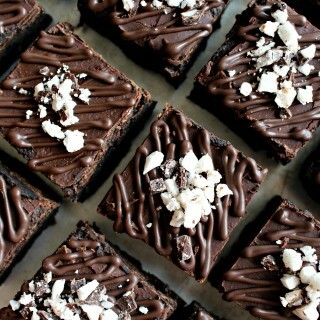 these look phenomenal – so gooey & yum. You must be filling better! Look delicious. Thanks, Sarah! I would consider it kitchen desperation! 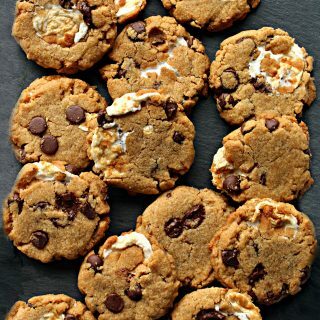 My family is loving these “ingenuity cookies” and the sad part is that I can’t even try one (as they take seconds and thirds) because I am allergic to nuts! Gluten-free baking is definitely a whole different ball game! My sister and mom both have to do the gluten-free thing so family events are always interesting coming up with something that they can eat yet is still delicious for everyone! These cookie squares sound great! I’m glad you kept going and turned a possible disaster into something delicious! Thanks, Ashley! I have been trying to avoid buying all the unusual flours called for in some gf recipes but for the best results and for cost that might eventually happen. Cooking gf isn’t so hard but baking,as you said, is a whole different ball game! 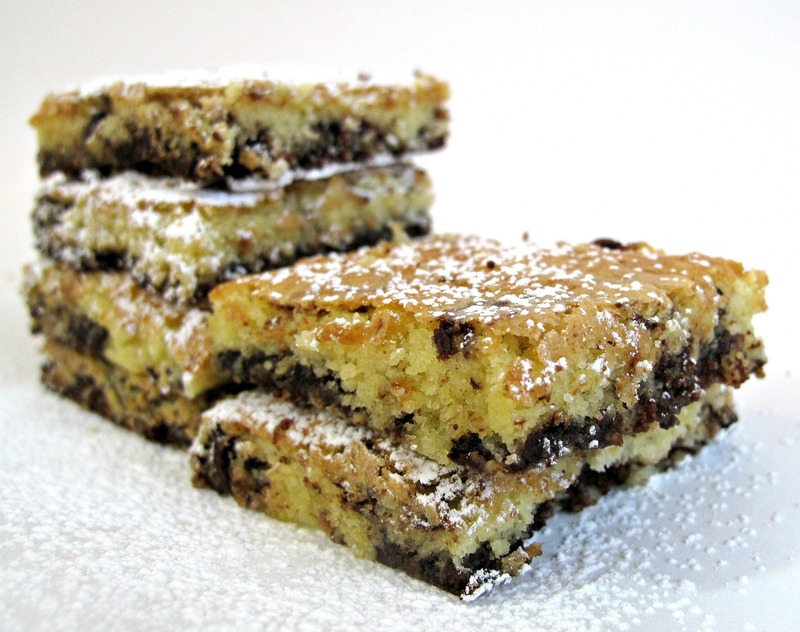 These cookie squares bake up almost cake-like. 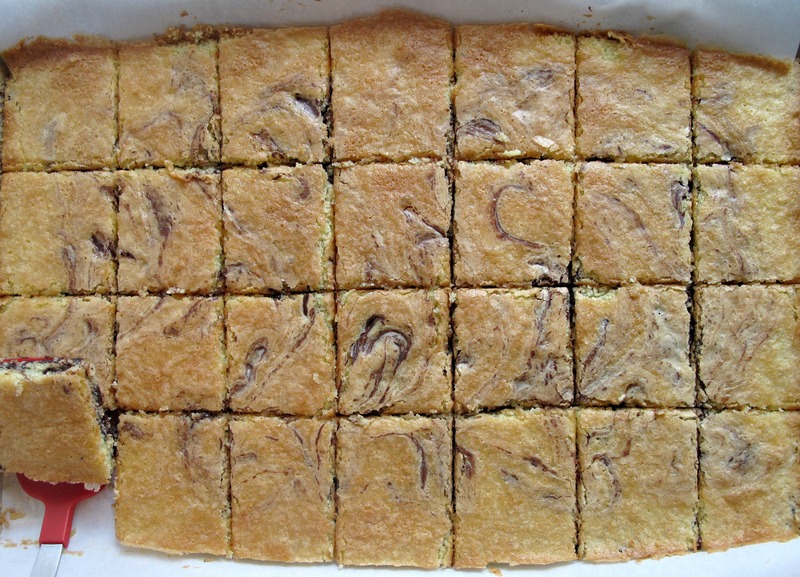 (In a smaller pan they might be cake squares…I have to try that!) I am so happy with the final surprising product! Monica, I wish I was making it up!! 🙂 Seeing that log of dough melted and dripping through me into OMG! mode. I wasn’t so much thinking on my feet as panicking on my feet! This is the first time one of my disasters has not only been edible, but probably better than what I was planning in the first place! 🙂 And I have done the crumbled cookie/cake in a parfait (sometimes as a cake pop!). Thank you so much for your kind words about my “kids”. I am very proud of the adults they are growning into. You are always so supportive, Monica and I really appreciate it!! You must be so proud of your daughter for completing her first half marathon. I can’t even read about other people running marathons without getting tired! I love this story of how a potential baking disaster turned into a delicious new recipe. 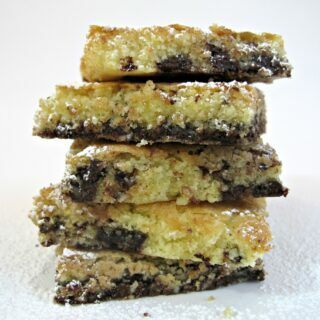 I’d never have known there was a tumultuous back story to these gorgeous chocolate chip almond squares! Seriously, they look delicious! yay for Meira! I have a great deal of respect for anyone who can run that far, seriously. and these bars! you have to hand it to baking accidents: sometimes, it’s horrible, sometimes funny, but sometimes, when you turn things around and make a disaster into an awesome treat, it’s totally satisfying. These look wonderful, and i’ll be excited to try these here at home. 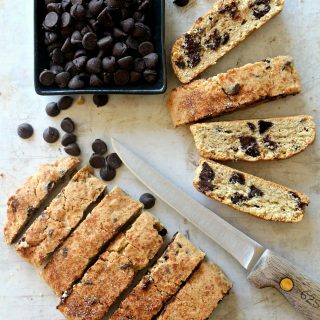 we’re not GF, but i dig a chocolate chip anything with almond flour, because it just adds that specific flavor and texture that only almonds can give things. love this. Thanks, Shannon! Running is so out of my comfort zone that I could only stand and marvel as Meira took this on! I am awed, truly. The problem with a highly successful baking disaster is that there is the risk of misinterpreting luck for baking know-how. As in, “Look! I have learned something about baking and can figure out how to fix faulty recipes!” Though this was definitely only luck, you are right, it is satisfying. Do I remember correctly that you have a little gluten free cousin? These cakey bars are totally “normal” tasting and I think they would receive a big thumbs up from kids. Yeah!! I love a successful recipe accident! You have every right to be proud of your daughter – that is a great accomplishment! Thanks, Tricia! Meira sets a goal and goes for it! She has always made me shake my head in wonder. 🙂 Successful baking accidents are so rare in my kitchen that I was as surprised as I was thrilled. I get so frustrated when recipes from highly reliable sources end up in the trash! Thanks! These bars don’t have flour which fits your new eating plan….I wonder if something could be done about the sugar to make them fit your plan too? I love it when accidents turn into successes! These sound fantastic! 2 of my nephews are gluten free, so I’d probably make these pretty soon. What a great save! 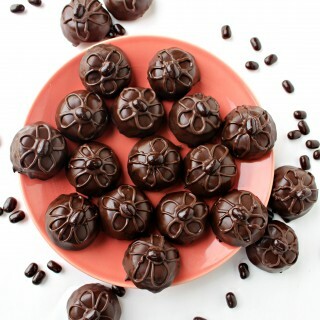 They look and sound absolutely delicious! I love the flavor and texture of almond meal in baked goods. Your daughter rocks! That is a great accomplishment. Thanks, Reeni! 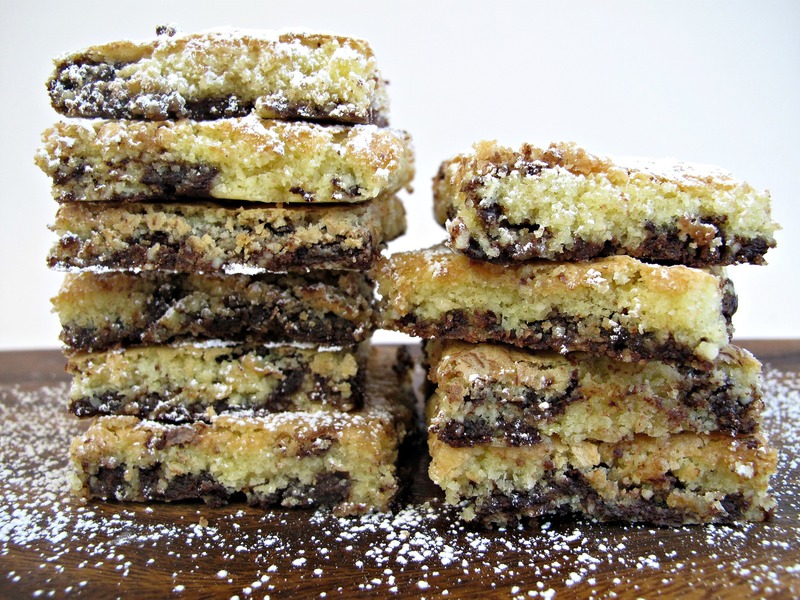 These cookie squares will be making frequent appearances at our house and I have already received a request for more in an upcoming care package! I really should have named these Serendipity Bars. 🙂 My daughter’s half marathon really was a great accomplishment! Have you ever tried making these low carb by using Splenda instead of the sugar and coconut flour instead of the potato starch? Thanks, Nicole! My family has been devouring them! Happy Passover! What a happy mistake that turned out to be~ Thanks for sharing with us on Throwback Thursday!